The U.S. Bureau of Labor Statistics (BLS) released the monthly and annual inflation rate data for October 2016 on November 17th. The current annual inflation rate is 1.64% up from 1.46% in September. Monthly inflation was 0.12% for the month of October 2016, while October 2015 was -0.14%. meaning that as the negative number fell out of the calculation and was replaced by a positive one, annual inflation jumped up. Historically, the 4th quarter, i.e. October, November and December have been negative inflation months i.e. disinflationary. So having positive inflation for the month of October is a bit unusual and could indicate a trend toward rising inflation or it could simply be the result of a temporary rise in gas prices. According to AAA Nationwide gas prices a month ago averaged $2.24 up from $2.18 in September and $2.12 in August. So the pressure of increasing gas prices could be having an effect on inflation rates. Experts like Dr. Kent Moors are projecting that oil prices could fall once again, eliminating that upward pressure. See: Current Annual Inflation Commentary for more information. See: The Current Misery Index Chart for more information. 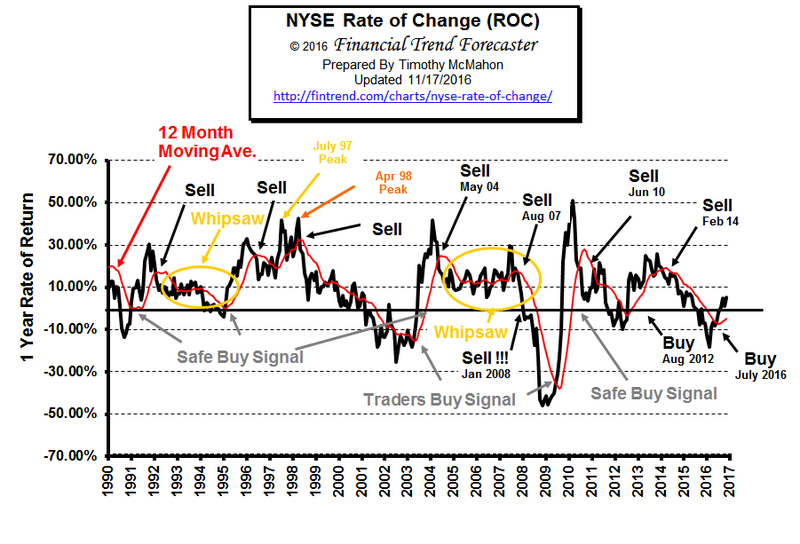 The NYSE Rate of Change (ROC) chart is helpful in getting the “big picture” of the stock market very quickly. The old saying “a picture is worth a thousand words” is very applicable to this chart. Prior to the election, the media consensus was that the market had already figured in a “Hillary Win” and they predicted that if Trump won… the market would take a major dive. However, The annual rate of return was only 1.10% last month, so the market wasn’t so optimistic about a Hillary win. And, in the seven trading days since the election, the NYSE has tacked on a full 2%, bringing the annual rate of return to 5.36%! So, not only did the media get the election prediction wrong, they also misjudged the market’s reaction to a Trump win. This month the ROC and its moving average are both rising. The ROC is still quite some distance above its moving average. However, the market could still take a dive next month if the FED raises interest rates. See: NYSE Rate of Change for more info. The NASDAQ index increased 1.82% since last month and remains above its moving average which is currently at the zero line (hidden under the green “X”). Thus maintaining a buy signal. Annual return has dropped to 6.22% from 6.77%. The green and red “X’s” indicate where the NASDAQ ROC crosses above and below the zero line respectively. From the first green “X” in March of 1995 to the final Sell signal in April of 2000 was roughly 5 years (although there was a minor cross in October 1998 which probably should have been the end of the bull if it weren’t for FED intervention). See: NASDAQ Rate of Change for more info. October’s annual inflation rate was 1.64% up from September’s 1.46% and August’s 1.04%. Our MIP was projecting an up-move with a minimum of 1.61% and a maximum of 1.71%, with a midrange low of exactly 1.64% so the actual move was at our mid-range low projection. Monthly inflation was 0.12% for October 2016, replacing a -0.04% for October 2015.